Just a heads up since this reset every week. At 12pm (Eastern Time)/ 9am (Pacific Time) you can click here and like Axe on Facebook. 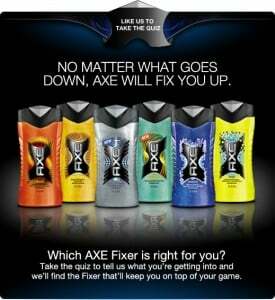 Then answer their 6 questions on the “Fixers” tab and you’ll be able to request a coupon good for a full size bottle of Axe Body Wash.
all my husband uses is axe! Love the way this mans my husband smell!! gone before they said it starts.. not happy. grandson could ready use this body wash.
My son uses axe , he loves it. MY BOYS SIMPLY LOVE IT.. I LOVE AX but it was GONE before it saiys it started … what gives Axe ?!?! My son loves Axe products!!! Thank you so much for the wonderful offer! I cant wait to get a sample.I heard it good stuff! would like to have my sons try. My husband loves Ur hole line of things.